Here's my latest "Suzi...esk" painting. I love to do this style painting but its almost time for school to start again and I must do some of that getting ready stuff. Also there's Halloween on ebay. So I guess I should be thinking in that direction. Hopefully I will be getting some things on ebay this week. Check out my ebay by clicking on the right. Have a happy day, I'm off to tennis. I love this painting!! Great work! 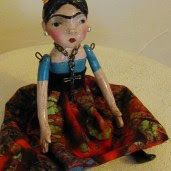 Your Frida is very expressive, Nancye! I adore your enthusiasm and productivity. Although Picasso was never my cup of tea esthetically speaking - at least for some of his periods, he was one of my favorites because of his constant productivity and freedom to move to new things. I believe you also have this charisma and it's weird to me that you still need permission of any kind to call yourself an artist, or if this "title" is too heavy for you, at least to paint. When I will stop to be so shy myself, I would like to show you some of my stuff. Until now in my blog I post mostly some of my photographs but there is somewhere also an illustration i made, and if you pass from there you can leave me a note.